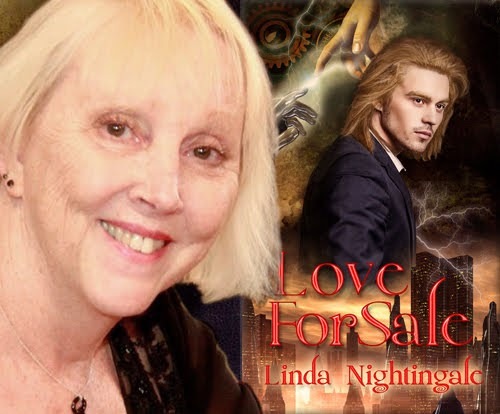 Thank you for joining us for The Audio Books: Love For Sale & Vampyre Rhapsody by Linda Nightingale Tour! Both are Science Fiction Romances, published by The Wild Rose Press. Don't miss our interview with author Linda Nightingale. PREVIEW: Check out the books' synopsis, audio samples, trailers and excerpts below. Visit LindaNightingale.com and look around. 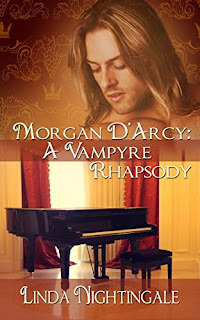 There’s a free continuing vampire story starring Morgan D'Arcy: Vampyre Interlude. 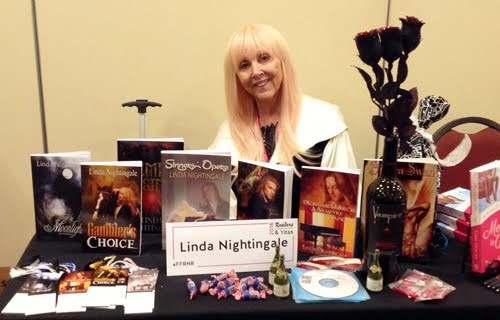 Author Linda Nightingale will be awarding a $25 Amazon/BN gift card to a randomly drawn winner via Rafflecopter during the tour. Please do take part: comment on our post and follow the tour where you will be able to read other excerpts (☀), interviews (ℚ), reviews (✍) and guest blog posts (✉). March Morgan still believes in true love, but her faith in finding her soul mate is slowly vanishing.She’s been married but never in love. So, it is a miracle to find that fantasy exists on the last page of a glossy women’s journal. Mayfair Electronics, Ltd., in black and white, offers Love for Sale. The London firm has engineered sentient androids indistinguishable from humans. She flies to England and meets the man she has been searching for her entire life. 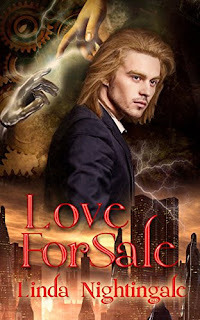 Unlikely soul mates, a disillusioned dreamer and an android identical to human, find their love, indeed their lives threatened by her past and his future. The greatest enemy of a vampire is boredom. Four centuries of existence have taught Lord Morgan Gabriel D'Arcy to fear nothing and no one. Humans and their weapons have little chance against his preternatural speed and arcane powers. Vampires are viral mutations of human DNA. Still, the Vampyre code requires secrecy, and he has learned to hide his nature from the world. The lure of mortality, of a life in the sun, puts Morgan again and again at the mercy of calculating human women though they fail to consider his charm and determination into the equation. However, even grooming a future bride from infancy proves to be fraught with heartbreak. And second chances are not always what they seem unless... you are Morgan. Immortality and beauty, aren’t they grand? Journey through the centuries with a sensual, handsome vampire - his dreams and his many loves - searching for the woman to finally become his wife ... through eternity. Thanks for hosting and thanks for the beautiful layout! You did a great job of showing off my new audiobooks! Thank you, Linda, and thank you for popping by! Apologies for the delay today! Hope you are having a great tour! Thank you, Lisa for following the tour. It's good to see you!